For over 50 years, the Klemencic family has been planning, developing, building and managing properties in the Quinte Area. 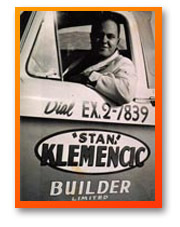 Founded by Stan Klemencic, and starting with a Duplex or two, and moving on to 6-plexes and larger multi-unit building, including building the first high-rise building in Belleville, The Klemencic family has been managing rental properties since the 1950’s. While some properties have been purchased, developed and sold over the years, the vast majority of apartment sites that we have developed have been sought out, planned, built and retained. Because we own what we manage, we are committed to maintaining our buildings to a high standard. We pride ourselves in offering what we believe to be the best rental value in the Quinte Area.